La Sirène is committed to changing the way current and future generations approach anti-aging remedies and preventative skincare. We take pride in developing beauty and wellness products of the highest quality and utmost standards. Defy The Tides Of Time and Unlock The Treasure Of Endless Beauty That Lies Within You! Collagen is a naturally occurring protein and the #1 building block in the human body. As your body matures, collagen production begins to diminish and as a result, the aging process begins to physically show. With regular consumption, the body retains and maintains optimal collagen levels and begins to restore strength and vitality to the skin, hair and nails. With regular use of La Sirène Beauty Collagen, you will begin to notice smoother, more radiant skin and the appearance of fine lines and wrinkles will diminish. Your hair and nails will also visibly grow healthier, longer and more resilient. On a deeper level, collagen is also essential to muscle, bone and joint health. The aging process takes a toll on tired and strained tendons and ligaments, and cartilage weakens and breaks down. 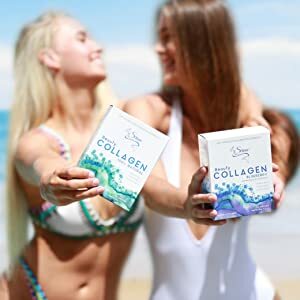 By introducing a collagen supplementation regiment into your daily diet and beauty routine, connective tissues, muscles, cartilage and bones are preserved, strengthened and restored. In addition, it may also assist in strengthening the immune system and detoxifying the body. Research and testimonials also show that supplementing with collagen can promote weight loss as well as increase lean muscle gain. As the Japanese have known for centuries, supplementing with natural marine collagen results in resilient health and everlasting youth. Harnessing the knowledge of this Japanese beauty secret, La Sirène's Beauty Collagen is currently available in 3 formulations so that you may select the beautiful benefits that are right for you. Choose from 100% Natural Marine Collagen, Blueberry with Acai Extract and Co Q10, Orange with Vitamins C, E and Co Q10. 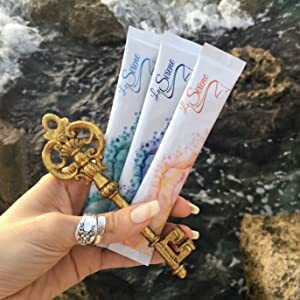 For a Natural and Effective Anti-Aging Solution, or if you wish to possess the mermaid's gift of Radiant Skin, Strong Nails and Lustrous Hair, La Sirène is your key. 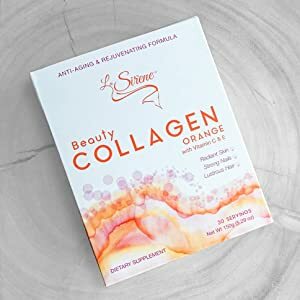 What is Orange Beauty Collagen? A dietary supplement enriched with natural antioxidants  Vitamin C & E, along with Coenzyme Q10  that work from deep within the cells to nourish and rejuvenate the skin, hair, and nails while detoxifying the body and boosting the immune system. It's an easily ingestible powder that's perfectly measured at 5 grams and conveniently packaged for on-the-go use. La Sirène's Orange Beauty Marine Collagen is produced in Japan and derived from the scales of wild tilapia. Is it Suitable for You? Since collagen is a naturally occurring protein in our bodies, supplementing with La Sirene's Beauty Collagen is safe and effective for Men and Women of all skin and body types. Safe to consume whilst breast feeding. If you are pregnant or taking prescription medication, please consult with your physician before consuming daily. Not recommended for those with FISH ALLERGIES or persons under the age of 16. Preparation and intake of La Sirène Beauty Collagen is made simple by conveniently dissolving 1 sachet into 6-16 oz. of water, juice, tea or a smoothie. You may even add it to your favorite yogurt, acai bowl desserts and more. For optimal results, consume 2 sachets daily. Do not exceed 2 sachets a day. DOES NOT CONTAIN: Soy, Salt, Starch, Corn, Yeast or Nuts.